The transpersonal approach to counseling and psychotherapy is open-ended and inclusive. It might involve altered states of consciousness, mystical insight, paranormal powers, and contact with the divine. 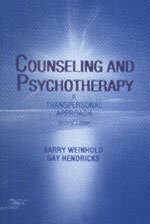 Transpersonal counseling takes a broader view of humans than the other approaches to therapy. It is whole and connected with all. You will find this edition to be on the cutting edge of transpersonal counseling. The processes and activities are designed to change thoughts, behaviors, and human potential. Transpersonal counseling and psychotherapy help clients to expand their view of themselves and consider all life experiences. Topics include human energy patterns, feelings, personality issues, spiritual growth, meditation, and movement therapy. This book will bring new ideas to your thinking. It includes examples and firsthand experiences and accounts.